Bread can be an economical food source for pigs, because bread that is not sold in supermarkets is returned to the bakery. The bakery will sell it to farmers for a greatly reduced price. Bread alone is not a complete diet, since pigs also need fiber, vitamins and protein. If you have a large bakery nearby, it may be worthwhile to check the costs of feeding pigs stale bread. Purchase the white bread from your local bakery outlet. Remove the plastic wrappers from the bread. Store the bread in barrels or bins, where it won't get wet or moldy. You can store bread for a few days. Feed approximately 25 percent more bread than you would the equal weight of corn feed. 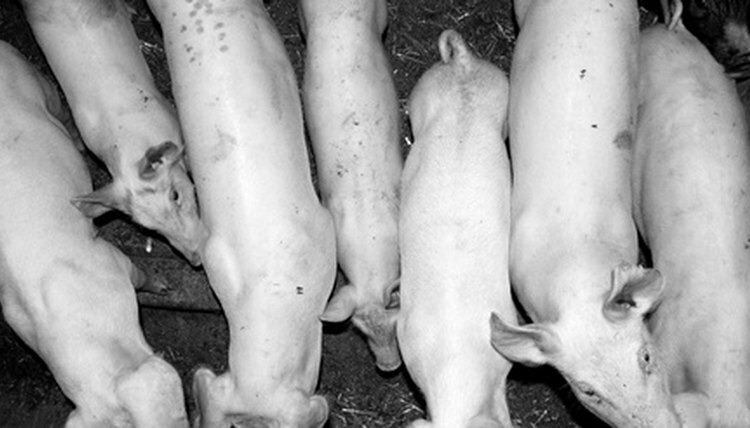 Bread has fewer calories than corn feed, so the pigs need more for proper weight gain. It has more moisture, and depending on the type of bread, can have more salt. Calculate the costs of corn feed versus bread. Since bread has 25 percent less value as feed, it only becomes economical when the price of bread is more than 25 percent less than corn. If corn is $4 per bushel, it works out to 7.1 cents per pound. Bread would be economical pig feed if it were less than 5.4 cents per pound. Feed extra sources of fiber in addition to the bread. White bread is less than one percent fiber, so pigs may suffer from constipation if not given access to other fiber sources. Since bread is not a complete diet, supplement vitamins and minerals in the pigs' diet as if you were feeding grain-based feeds to avoid dietary deficiencies. Make sure you remove any twist ties or plastic tabs so the pigs don't swallow them.